6 Mega Moments that will have you booking the next flight to the Straits! There’s so much to see here in the Straits of Gibraltar it’s sometimes hard to know where to start! Every day is different and that’s what makes it so special – for every group or person we show around there are special birding moments we get to share with them. Here’s a selection from the past week to get you reaching for your passports! We love to treat our guests to some great surprises when they’re out and about with us! As Gill and I finish up our tasty lunch, and pause to admire a Cattle Egret colony in their beautiful peachy breeding plumage, I am hardly able to contain my excitement as I attempt a nonchalant stroll down the side of the main road! I can tell Gill is wondering why I’m practically skipping at the thought of getting better views of the Jackdaws on the cliff face. I love the moment when the penny drops and a huge smile spreads across her face as she realises she is looking at a Northern Bald Ibis! This weird and wonderful punk of the bird world is an iconic local species, and although the successful reintroduction programme is yielding an increasing population it is still one of the most endangered birds in the world, and the incredible close-up views of this fascinating breeding colony are probably the best in Europe, if not the world. Here at the Inglorious Bustards, we pride ourselves on tuning in to the needs of our guests, whether they be expert birders or complete beginners. The Pulverers, first-time birders from Sweden, were staying at our base at Huerta Grande and hanging out with me to try out birding as a new experience. I loved sharing my beloved Straits with this fabulous group. By some stroke of fate it’s almost as if the birds knew, and the day’s sightings were even closer than usual! 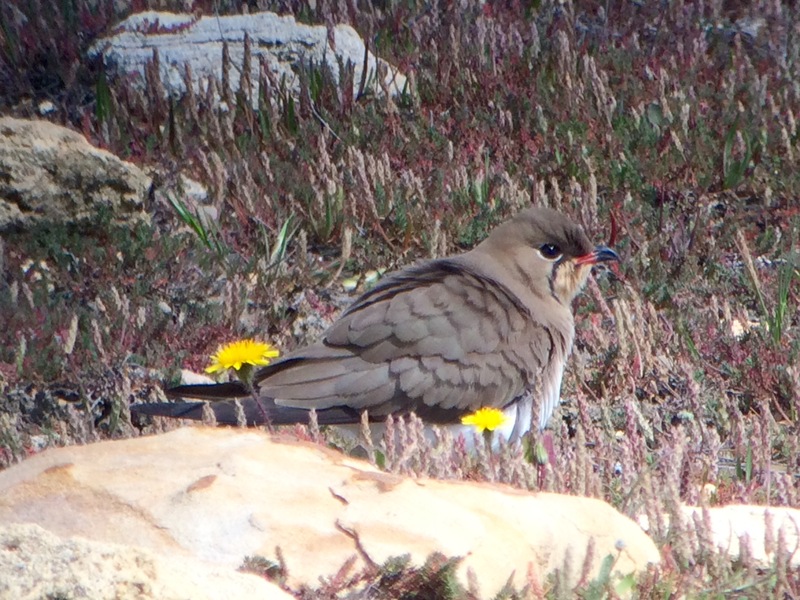 The very first bird of the day was the brilliant little Collared Pratincole, which not only sat up right in front of us but made the group fill with admiration at their fluting calls and pretty tern-like flight – the perfect appetite-whetter! They’ve not long since arrived back here, and can now be seen at their breeding grounds alongside Stone Curlews and Kentish Plovers, amongst many others. For the keen birder that wants to learn more, the Straits is such a great place to be at this time. Over two days with Gary we really got stuck into the resident larks, all singing and displaying often within metres of each other. With a living Collins guide right there before your eyes and ears, and a helpful Inglorious Bustard to help you bring the ID features to life, suddenly it all makes perfect sense, and Gary will now forever confidently know his Crested from his Theklas and his Calandras from his Short-toed! As our day went on, the Pulverers were loving not only seeing the amazing birds around the Straits, but also hearing about their stories and journeys. 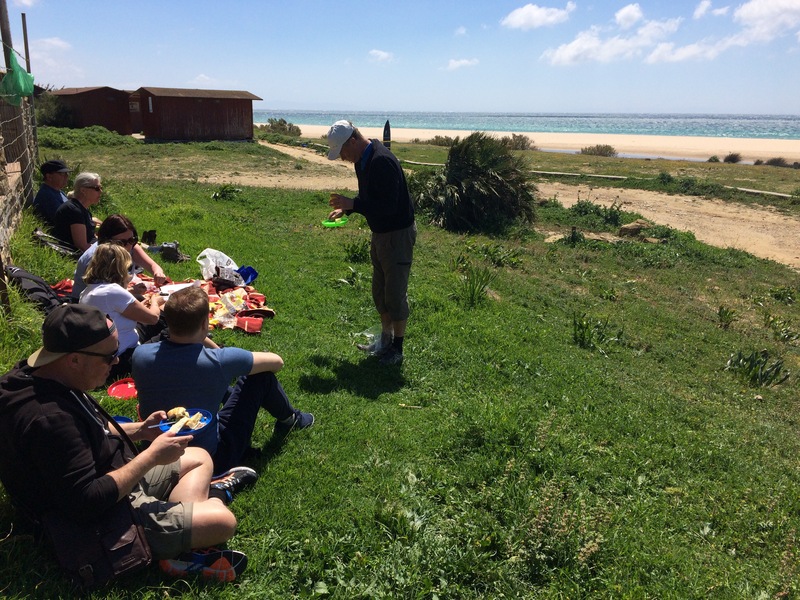 As we picnicked by the beach in Bolonia, we were treated to the antics of a host of migrating waders and terns around one of the area’s excellent inter-tidal pools. How brilliant to think that some of these very birds, having already made it to Southern Spain, may well be waiting to greet the Pulverer family when they return home to Sweden?! We raised a glass of Rioja in the sun to the Sanderlings! And last but overwhelmingly not least! Of course for all its fascinating nooks and crannies, and migratory and resident species, the birding experience which makes the Straits the place to be in Spring and Autumn is the spectacle of thousands of raptors and soaring birds crossing this narrow stretch of sea between Europe and Africa. Although you can encounter raptors every day, to experience this happening at its best you need not only a bit of luck with the weather, but also local knowledge and skill to predict how these conditions will affect how and where the raptors will arrive. 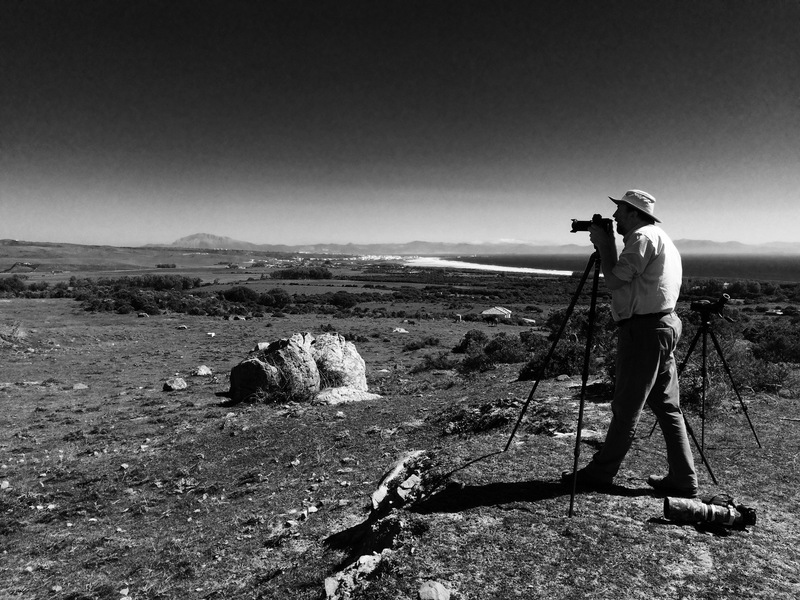 Despite the strong easterly winds, things were really happening today, and Gary and I were already buzzing from seeing a flock of several hundred White Storks arrive in Spain, while we enjoyed a lunchtime gazpacho. 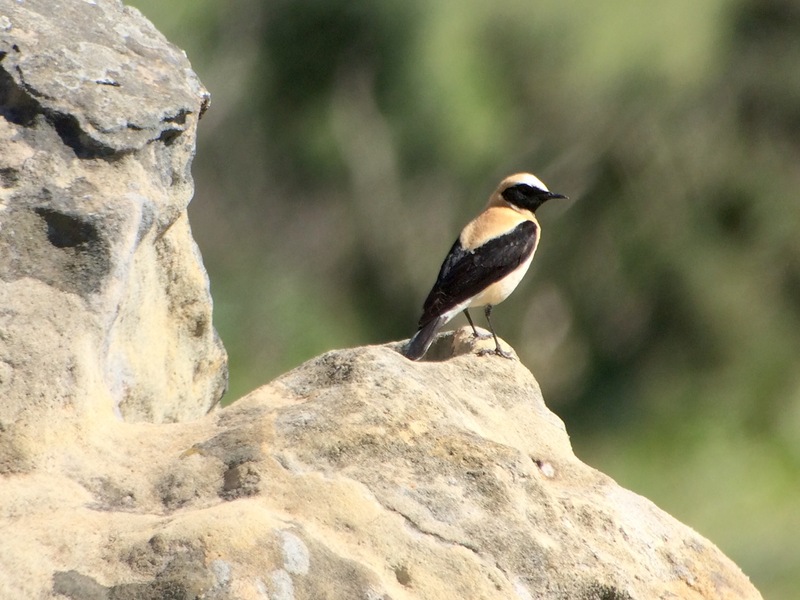 At a stop I had chosen in the hills west of Tarifa, we were admiring a stunning little Black-eared Wheatear when suddenly it was happening! Looking out across the Straits, we could see the air was thick with raptors, and with minutes they were all around us, and we shouted our welcomes to hundreds upon hundreds of Black Kites, Booted Eagles, Griffon Vultures and Sparrowhawks as they flooded up the valley low around us! Bienvenidos en Espagne!!! We love sharing these moments with folk, whatever their birding experience or approach. We really hope that it will be you! We still have availability on our Spring Strait Birding and Cetaceans Tour, and you can make the most of these joys on our Autumn tours too – why not treat yourself to a few Mega Moments of your own?